SiriusXM Satellite Radio is available with the 2018 Grand Caravan. With this feature, you can enjoy more than 130 music, entertainment, and news channels to keep everyone in the minivan entertained. Another technology feature that is equipped with the 2018 model is Three-Zone Automatic Temperature Control. This allows the driver and passenger to personalize the temperature settings to keep everyone in the minivan comfortable. 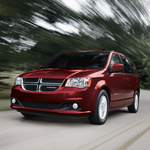 We invite you to visit our showroom at Chilson-Wilcox to look through our inventory and take the 2018 Dodge Grand Caravan for a test drive.